Now, for the veteran parents out there, you are likely experts in all of the important meanings of the shades, textures, and liquidity of one’s child’s poo. For a soon-to-be-parent who knows nothing of this important subject matter, however, a job aid was extremely helpful — not only for providing reference points and context for my husband and I during the class (we are both the youngest children in our families and the first to have our own children, so our poo experience is rather limited), but also useful for us to take home and use “on the job” here in a few weeks. But, similar to many job aids you may have received over the course of your professional lives, our job aid quickly got placed in a stack of VIPs (very important papers) that will likely collect dust and not be in any way accessible to me in the middle of the night, in a few weeks, at my moment of true need. This got me thinking: Do the job aids I build for client course’s end up in a VIP stack in someone’s office, unable to be accessed when the poo really does hit the fan and they need their job aids on the job? If you’re working on job aids for a course you are developing for yourself, or maybe when designing one with a vendor-partner, here are a few great tips you can use to keep your job aids from ending up in a stack of dusty VIPs. Don’t make a job aid just for the sake of making a job aid. If you’re going to take the time to invest in developing a job aid, and then delivering it (whether in print, digitally, etc. ), take a moment to pause and ask yourself, “Will my learners actually use this job aid?” If you were performing the task a few weeks down the road, would you take the time to find your job aid amongst your dusty stack of VIPs, or would you simply “Google it” or IM someone to find a quicker response? Job aids are excellent tools when relevant and useful. Invest only in making job aids that serve an ongoing purpose. If you’re not going to reach for the job aid next time you complete a task, don’t expect your learners to either. If you make a job aid, make the format accessible for use on the job. This sounds obvious, but ohhh how often we miss this. Let’s take my job aid for example: In the middle of the night, when suffering from multiple weeks of sleep deprivation, am I going to find my job aid and compare real-life sample colors to those outlined in my brochure? Probably not. But, say, perhaps I had been given a simple laminated card for example with basic colors and meanings on it, I might pin it up right next to my changing station for quick reference in my time of need. Whether you’re making print job aids, or digital job aids, think about where your learners are going to be in the moment they need the job aid. If they’re sitting at their computer, there’s likely no need for a printed job aid. Your job aid has to be accurate and easily kept up to date. For a job aid to be useful, it has to be accurate and easily kept up to date. For example, if you are selecting a new paint color for your kitchen, it does you absolutely no good if the job aid (the color sample) ends up being drastically different than the color that actually appears on your walls once you’ve purchased and applied the paint. Similarly, if you create a job aid that gives instructions on how to access an online software system, the job aid has to be in a format that can be kept up to date should the system change. Depending upon your job aid, you may find that digital or print is a better fit in helping you keep your job aid accurate and up to date. What tips do you have for designing useful job aids? 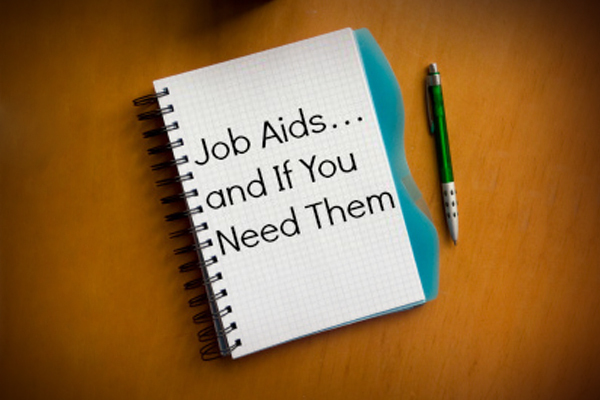 Another tip I’ve found useful, but often ignored, is the tendency to apply “one size fits all” approach to making job-aids for jobs that are very similar but not quite the same. A job aid needs to be very specific to only one job. So, five similar jobs should have five job-aids specific to each job, rather than one job-aid that broadly includes all specifics of each job. You know your job-aid is running off the rails when it approaches a size comparable to a manual or training session handout. Great comments Subrata! Job aids are best when they are specific, short, and easily accessible. Generic job aids don’t really do anyone any good. A job aid should serve a useful purpose, if the employee could easily Google the answer to find out what to do, the job aid may not be the best investment. In a recent training class that I am attending, I received the most perfect “job.. If You Build It and It’s Not Mandatory, Will They Come? I’ve been working with a client this week who is seeking to develop a training..
You’ve done your homework and research, and designed a training program that you know will..
Two integral parts of any large change within an organization are gaining buy-in for the..